Lasers allow dentists to perform more accurate procedures in less time, with less pain, and little to no anesthetic. The diode laser Dr. Creech uses seals off blood vessels and nerve endings, preventing bleeding and greatly reducing postoperative pain and swelling inside the mouth. The FDA has cleared the use of dental lasers in treating certain conditions. These conditions include, but are not limited to, reshaping a gummy smile, gum disease therapy, easing tongue and cheek attachments, cold sores and canker sores. 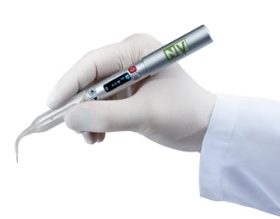 The diode laser is a tool that has been used in dentistry for over 20 years. Each year lasers are perfected with more sophisticated technology for more accurate procedures. Dental lasers are required to comply with international safety regulations. Will I be provided with eye protection? As a precaution, Dr. Creech will provide you with the required safety glasses before any laser procedures. These glasses have been specially designed to protect your eyes for added peace of mind. Laser energy is a form of light that is highly focused and monochromatic, or one color. A monochromatic color allows laser light to be set at a certain wavelength to attract certain molecules. In laser dentistry, these molecules are hemoglobin, water, and melanin- the molecules that make up your gum tissue. Because the laser is only attracted to your gum tissue, it’s a very safe tool to use. It will not affect hard tissue structure or any metal you may have in your mouth. It only affects the area of tissue your dentist wants to treat.